“A View to a Kill” is the thirteenth single by Duran Duran, released in May 1985. It was a stand-alone single, created for the James Bond movie A View to a Kill, and it remains the only James Bond theme song to have reached #1 on the Billboard Hot 100; it also made it to #2 for 3 weeks on the UK Singles Chart, held off the top spot by “19″ by Paul Hardcastle. In 1986, John Barry and Duran Duran were nominated for the Golden Globe Award for Best Original Song for A View to a Kill. 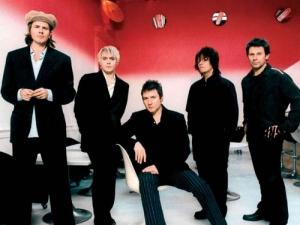 The song was the last track that the original five members of Duran Duran recorded together until their reunion sixteen years later, in 2001. It was played at their final 1985 performance together, at Live Aid in Philadelphia. The song was written by Duran Duran and John Barry, and recorded at Maison Rouge Studio and CTS Studio in London with a 60-piece orchestra. Duran Duran was chosen to do the song after bassist John Taylor (a lifelong Bond fan) approached producer Cubby Broccoli at a party, and somewhat drunkenly asked “When are you going to get someone decent to do one of your theme songs?” This inauspicious beginning led to some serious talks, and the band was introduced to Bond composer John Barry, and also Jonathan Elias (whom Duran Duran members would later work with many times). An early writing meeting at Taylor’s flat in Knightsbridge led to everyone getting drunk instead of composing. The song was finally completed in April, and was released worldwide in May. The song was accompanied by a tongue-in-cheek video filmed in June. It was directed by the duo Godley & Creme (who had also directed their 1981 video for “Girls on Film”.) The video cast the band members as spies and assassins scampering all over the Eiffel Tower, in a rather tangled thicket of half-sketched storylines. Band members shoot at, take pictures of, spy upon and direct sonic accordion attacks upon each other as the lead singer Simon Le Bon wanders about, using a portable cassette player to set off a series of explosions elsewhere in the world. 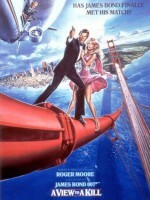 These shots are intercut with scenes from the movie A View to a Kill, including those featuring Roger Moore and Grace Jones on the Eiffel Tower, so that it appears the actors and the band are participating in the same storyline. Le Bon ends the video with a parody of James Bond, smarmily introducing himself as “Bon. Simon Le Bon.” After saying this, he looks at his fake cassette player to see that Eiffel Tower was about to explode. Instead of the entire tower collapsing, a postcard, showing a view of Eiffel Tower, that is being sold at a tourist stand on the ground floor explodes as a gunbarrel closes to end the video. The b-side was an instrumental piece orchestrated by John Barry, titled “A View To A Kill (That Fatal Kiss)”. It is thought that there was no 12″ remix for the song because the band ran out of time. However, Capitol Records did commission and receive at least one remix of the track.